Publisher: Classics of Medicine Library, 1984. Facsimile copy of the 1930 edition. Condition: Hardcover, full leather. Fair. All edges gilt, silk bookmark, acid-free paper. Noticeable scratches to gilt edges and some foxing to foredge. Fading and wear to top edge. Binding tight, text clean, still a beautiful copy. With publisher’s insert. Avicenna (980-1037 CE) was known as the Prince of Physicians in the Persian empire of his time. In 1012 he began writing this, his great medical text. He lived for fifteen years in Isfahan and died in Hamadan. 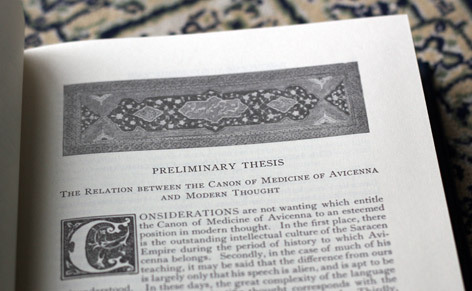 The Canon of Medicine (Arabic: القانون في الطب ) is an encyclopedia of medicine in five books compiled by Ibn Sīnā (Avicenna) and completed in 1025. It presents a clear and organized summary of all the medical knowledge of the time. 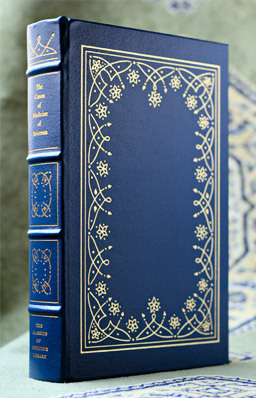 Used as the standard medical text for 700 years in Europe and the Middle East, upto 1850. Originally written in the Arabic language, the book was later translated into a number of other languages, including Persian, Latin, Chinese, Hebrew, German, French, and English with lots of commentaries. 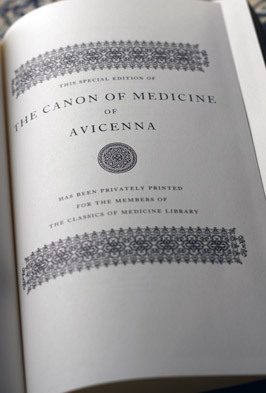 The Canon is considered one of the most famous books in the history of medicine.